For the past couple of days I have been looking online at children who need an adoptive family. Let's get some things out in the open here - I have no desire to have kids of my own, biologically that is. I think questions like, "When are you and your husband going to have kids?" are quite presumptuous, incredibly intrusive, and to be frank, RUDE! Since I spent time in orphanages in Russia, Kazakhstan and working with kids in Peru, I have had little desire to have my own children. The feeling does come and go from time to time, but I think that's more societal pressure than my own desire to have kids. 1). Kids who don't have a place to call home. 2). No place to go during Holidays once they are older. 3). No one to share a first love experience with. 4). No one to lean on for support. 5). Those without grandparents to spoil them. 6). Kids who don't have someone rooting for them during graduation. 7). Folks that have no one to teach them how to drive. 8). Those that have on one to encourage them to go to college. 9). No one to teach them how to cook. 10). No one to be there when they get married or walk them down the aisle. Thinking about these things just break my heart. There are so many teens/preteens that do not have this kind of support. I'm not committing myself to adopt or foster teens at this point, but these are the things that break my heart. I truly think that God brought these students into my life over the last few years for a reason. 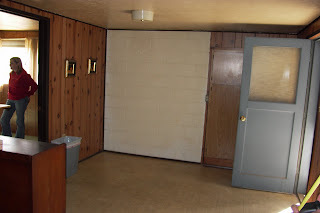 Here are the before and after pictures of the room. Wow, what a difference. This first pic is the view standing from the stairwell. This is the view looking at the stairwell. 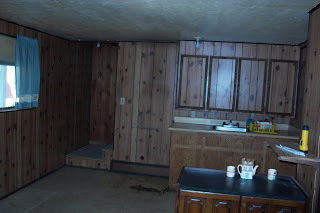 Don't you just love the ugly cabinets that were installed somewhere in the 80's. The "cabin feel" is obviously what they were going for here. What a breath of fresh air, don't you think? In case you can't see the detail of the picture, just click on it and it should get bigger. The handles on the cabinets are brushed nickel. Shawn picked out the faucet because it pulls out. In this picture you can also see where the stove is supposed to go. It will be located where the dryer currently is. We have run wire (really expensive wire) to the location behind the dryer. We will eventually get a stackable washer and dryer and put it where the washer currently is and install a stove where the dryer is. We may even build a custom cabinet from floor to ceiling to cover the W/D at some point. I finally got a window covering for the window. Click on the pic to enlarge it to see the detail of the very dainty/girly curtains (thanks to my mother-in-law who had extras and gave me the curtain). In case you can't see it, the floor is a natural color, and so is the counter. We are going for a beach themed room here, and will probably take a day trip to the beach this summer to take more photos to put up in the room. We will also be installing upper cabinets eventually. That will probably take place at some point this summer. One can never have too much storage right? I promised some folks that I would post a pic of the Kitchenette/Laundry Room in our house. This project has taken us about 4 months on and off. Without further ado, here is the room as it looks today. I will add another post later this weekend with the before and after pics. Enjoy! This post is for my brother-in-law who just loves my saffron rice with balsamic sauce. I usually make this rice with skewers, both meat and veggie, marinated in a Greek style dressing. It's a summer favorite at our place. Directions: There is a very specific recipe and technique for making this type of rice, which incidentally is a Persian recipe. But I don't follow the recipe. Here's what I do: put the rice in a pot or rice cooker. Rinse 3-4 times in cold water until the rice runs clear. Add water, salt, oil and saffron mixture to the rice pot. Turn on, walk away and come back when it's done. In another pot I cook 1-1.5 cups of plain rice according to instructions (be sure to rinse the rice). Once both pots of rice are done, mix them together so there is clear defining colors. The saffron rice will be yellow/orange, and the plain rice will be white. Since we eat with our eyes, this is a very beautiful presentation. (This sauce is served spooned over Greek marinated skewers, and over the rice recipe above). Directions: Slice and/or chop the shallots into small pieces, but don't mince. You want decent sized pieces. Add them to the olive oil in a pan and saute until soft. Add the balsamic vinegar and chicken stock/broth and reduce by half. The sauce can be served over the rice, which is especially good. We also spoon it over meat skewers and veggie skewers that have been BBQ'd. A tip for skewers - in order to cook the veggies evenly, we make the meat and veggie skewers separately. These recipes are simple to make, and are a crowd pleaser. Anytime I take the rice and balsamic sauce to a party, or serve it at our house for a get together, I'm asked for the recipe. It's wonderful!